Celebrating a year of Gallery Interlude, and ringing in the next! 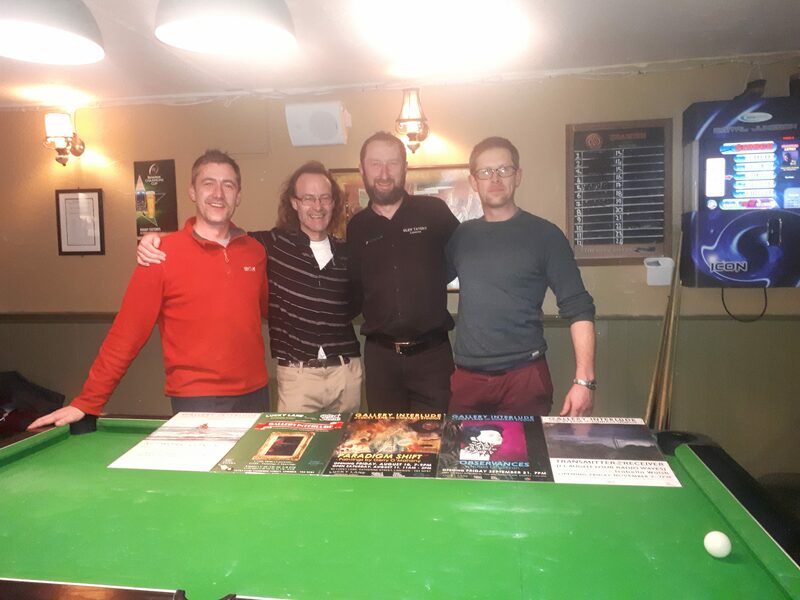 (l-r) Mark Sheehan (Lucky Lane, Carl Doran (Contact Studios/Gallery Interlude), Ger Callinan (Glen Tavern), Kevin O’Keefe (Bigger Picture Framing Centre). 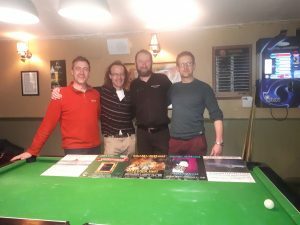 It seemed timely for Gallery Interlude and our sponsors to get together for a photo op this January, especially when we were presenting The Glen Tavern with their very own set of ‘Interlude posters. Interlude member – and future exhibitor! – Ciaran Nash has done a wonderful job designing our posters and brought a real sense of play and aesthetic to our program. Look out for them in our favourite Limerick hostelry in the near future. The Gallery Interlude team, myself, Isabella Walsh and Ciaran Nash, would like to sincerely thank Mark and Dave of Lucky Lane for facilitating our project since last June, and look forward to working with them in 2019. A massive thank you to Ger and the team at The Glen Tavern for sponsoring beverages for each show, not to mention the moral support! We are also very happy for the support of Kevin (Caoimh) of The Bigger Picture Framing Centre for keeping us in the frame. To all the Contact members and the public we’re extremely grateful, and look forward with some optimism for the year ahead. Go raibh míle míle maith agaibh!! !